Home » Blog » New production run in-stock! Myro:Bridge has been a huge success for us and we’re proud to have it back in-stock and ready to ship! 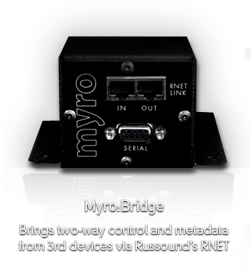 We’ve also heard back from our customers/dealers that Myro:Bridge is a great way to breath new life into their Russound audio system. Sonos and HDMI Matrix firmware are the most popular but since you can update/convert it in the field you can be sure that you can use the Myro:Bridge however you’d like for the particular job your at.